Wales' Lee Byrne wants to extend his contract with French Top 14 club Clermont Auvergne. The 32-year-old, a Lions test player in 2009, joined on a three-year contract from the Ospreys in 2011. Byrne has has been recalled for the Six Nations and says he would like to stay in France until 2015. "I've been here a season and a half and I've got another year to run after this. Hopefully I can extend," he said. "It's just nice being in a winning team, to be honest with you. "The plans here [suggest] were going to be doing great things here in the next couple of seasons and I want to be part of that really." 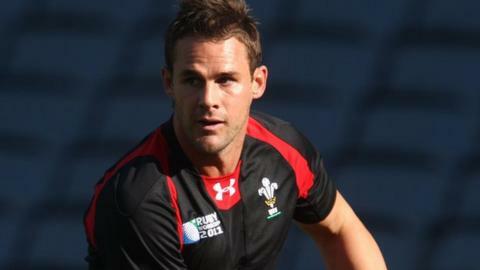 Byrne's departure was part of a drain of top Welsh players to French and English clubs, including fellow Ospreys players Mike Phillips, Craig Mitchell, Paul James and Huw Bennett. Now Byrne believes playing in a winning team at Clermont has helped him secure a recall to the Wales squad for the match against Ireland on 2 February. "It helps being in an environment where the team is doing so well," he said. "We've got so many experienced players there like [Sitiveni] Sivivatu who is always helping me, and it brings your game on." Byrne has been in impressive form, helping Clermont qualify for the quarter finals of the Heineken Cup. And while he accepts that playing in a winning team in France has helped him personally, Byrne does not believe his club's success in Europe is down to the size of their budget. "You can't buy a [winning] team, as we found seasons ago at the Ospreys," he said. "We had the best players but we didn't go that far in the competition." "It's difficult with the budgets in Wales with France being considerably bigger, but you've still got to put the performances in really. "We've got great coaching staff and we're putting it all together now on the field."